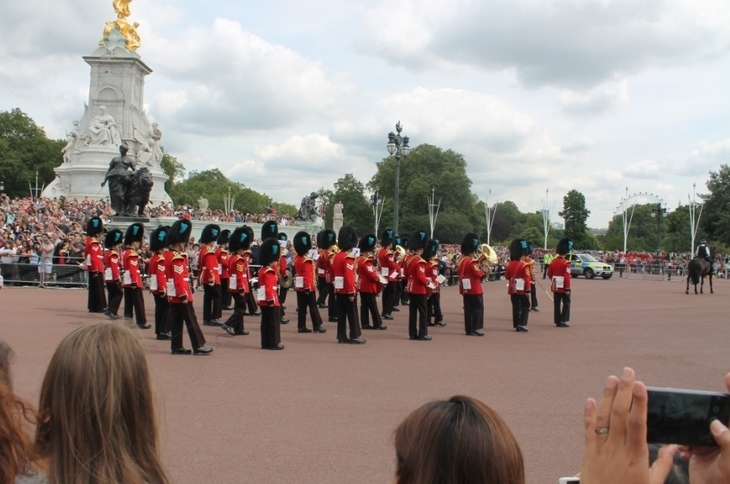 Why The Hell Do People Go To Changing The Guard? Will Noble Why The Hell Do People Go To Changing The Guard? Taipei does it. Moscow does it. Copenhagen does it. Cities the world over do it. But somehow it's London's Changing the Guard that the whole world wants to see. 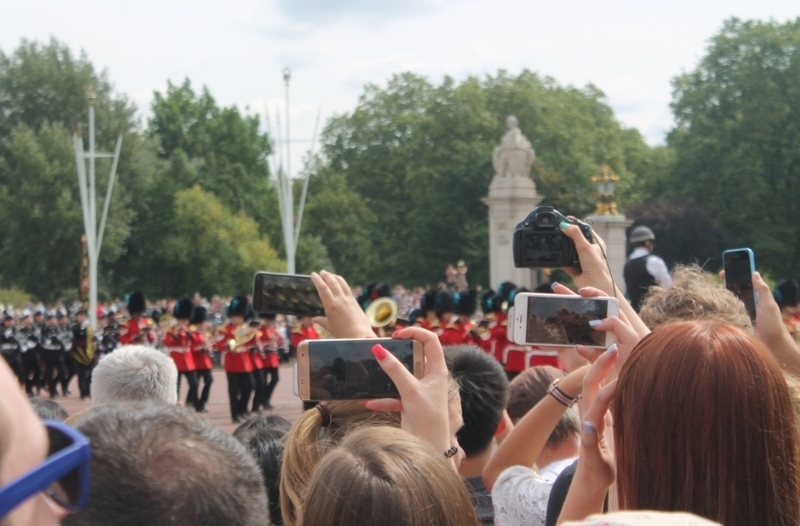 In this final word in pomp and circumstance — dating back, you could say, to the court of Henry VII — there's a smattering of red carpet glitz, a dash of VE day, and a lorry load of selfie sticks. 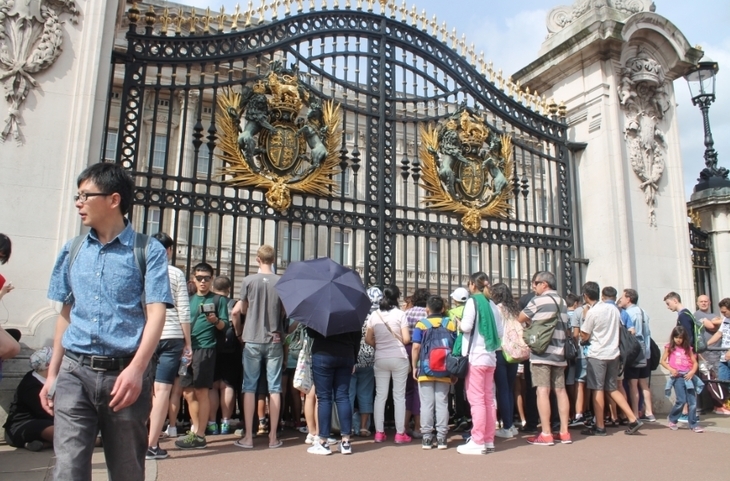 People thrust their faces through Buckingham Palace's railings, lubricated with sun cream. Sweating crowds become an extra layer of icing on the birthday cake that is the Victoria Memorial. International dialogues — a double concentrate of the usual London squash — bubble at one end of The Mall. Something's afoot. Thing is, half the people don't really seem to know what. Cara, Nat and Greg: unaware of Changing the Guard, but happy to stay and watch. "Changing... changing the Guard? Changing what of the guards? I don't know," says a young man called Vincent, over from Germany for a few days. 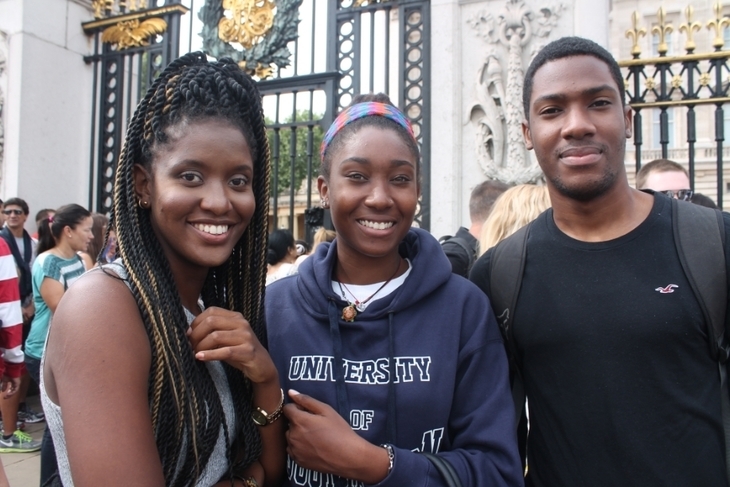 "We're trying to figure out what's happening now," says Greg, a student who's come for the day from Southampton, with his friends Cara and Nat. 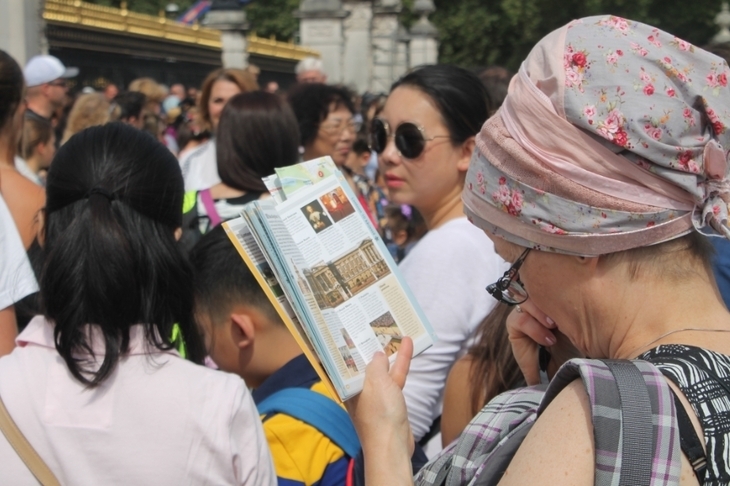 "We came for a look around, and then we saw this crowd and thought 'what's going on?'" adds Nat. "I haven't seen it before," he says, "I know it's famous. Everyone who comes to London — this is what they cannot miss." Karen and Ernie from California have been to the Sherlock Holmes Museum and the London Eye, and this is next down the list. Again, they don't know much about Changing the Guard, but they do know it's a must-see. Are they fans of the monarchy? "We have dinner together all the time," deadpans Ernie. With soldiers and bands streaming in and out, left, right and centre of Buckingham Palace, the police's biggest job is keeping the walkways and gates clear. Part of the game is knowing where to stand, when. Smiles one WPC: "It's nice, everyone's in a good mood. It's not like an event where people are protesting, anything like that." By 11.15, something is happening. There is distant pounding of drums down The Mall, and gradually a parade of brass-wielding busby heads, banging out an upbeat march, comes into view. This must be the detachment of the Old Guard and an accompanying band, heading from St James's Palace (it was, we've Googled it). They file into the palace courtyard and before long, near silence descends again. The odd military voice screams out something incomprehensible. We strain to see something. We mainly see backs of hot heads, the odd flash of red between the railings. It seems that if you're not right at the front, the ocular rewards are slim pickings. Selfie-sticks take on a life of their own, begin tapping you on the shoulder to excuse themselves, then edging past your ear. Calves flex as thousands rise to their tiptoes. It's every man, child, woman and mobile phone for themselves. Suddenly a band breaks into a brassy War of the Worlds. We look to the balcony to see if Jimmy Nail or Daniel Bedingfield is putting in a cameo. Whatever next — a rendition of It's Not Unusual? They break into It's Not Unusual. "Shall we leave?" says an American mom to her child. The view from four people deep. This is where we realise something: as blithely proud Londoners, we're not entirely sure what Changing the Guard is. We know it's an elaborate, precisely-timed game of tag. But the detailed ins and outs and the references to Tom Jones are confusing. What we really need is an expert like Matt Gedge, who we we met last year. But we have been fortunate enough to run into Michael Moore, a member of the British Monarchist Foundation: "I come 20 times a year," Michael says, "I have a South African neighbour, and the boy's parents are here so he said 'would you bring them?'... Well they haven't turned up but I will watch it anyway." Michael, a staunch royalist, and Sheila, whose son was part of the ceremony. 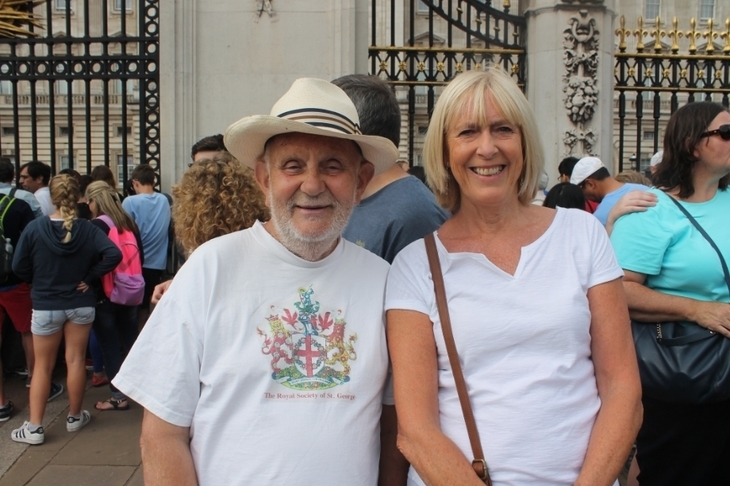 Michael is well versed at this waiting outside the palace malarkey: "I stood outside the palace for two days when Her Majesty was crowned," he says with no lack of pride in his voice, "I'm a great royalist. I just like tradition. Anything to do with tradition, which we still do better than anyone. "I have had the pleasure of meeting Her Majesty. She just said 'hello' and I said 'hello' and that was that." Is it ironic that the most excited person here today is a Londoner? That goes back to the fact we're still struggling to wrap our heads around it all; like that other great British institution, cricket, maybe you've got to endure it a few times before you're bitten by the bug. We reckon Michael likes cricket too. Toni (left) and Alex: didn't see much but still enjoyed it. 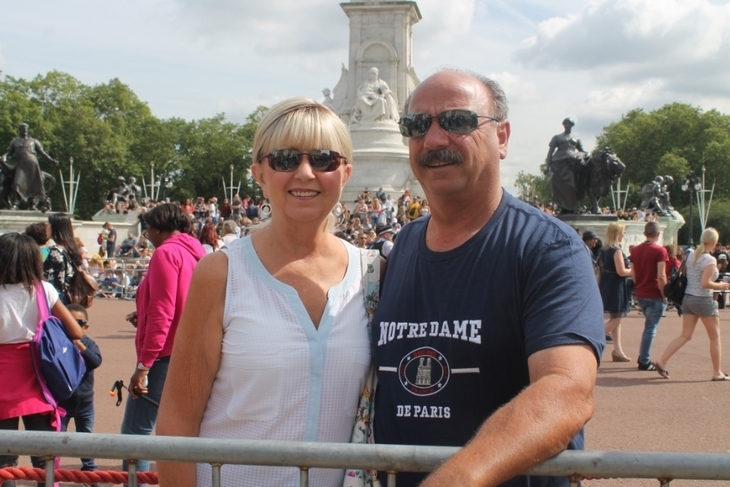 Michael is also with Sheila who has a very definite reason for showing up: her son is in the Queen's Colour Squadron in Northolt, and he's marching today: "They have a two-week stint at the palace a couple of times a year," she explains. "Hopefully I've got a good position here." She has, as it turns out — right by the gate where troops are to-ing and fro-ing. We should have stayed with Sheila. By 12.15, as a detachment of the New Guard marches off up The Mall towards St James's, and the crowds gradually dissipate, it's done and dusted. We feel like we've witnessed something special without really witnessing much of it — like people who brag about the swinging 60s. Actually not a bad view, as a detachment of the New Guard marches up The Mall. 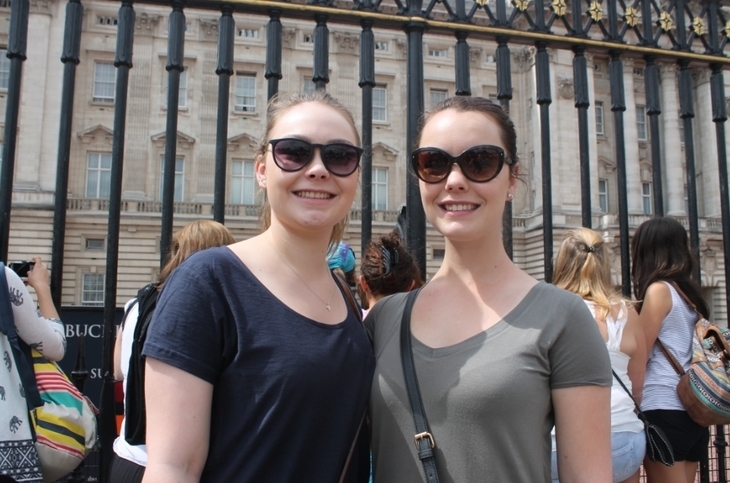 The feeling is shared by Toni from London, and her friend, Alex, visiting from South Africa. "We couldn't really see much! But it was pretty cool," says Alex. "She's got a thing for horses," explains Toni. "I can't believe that they have to do it every single day," says Alex, "that must be a bit tiring. But yeah, I really enjoyed it." London makes you feel a lot of things, but today it's dug out something special. Today, we have felt confusion and disorientation in central London. Today we have dawdled, stepped on people's toes, spoken to strangers. Today, we have truly felt like a tourist again. 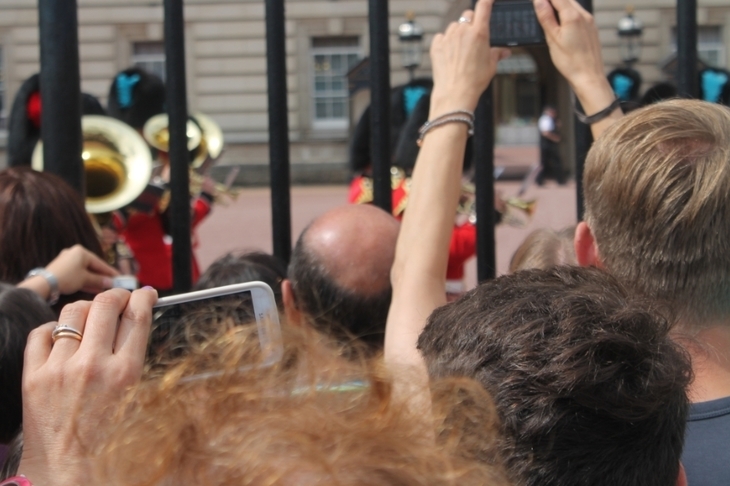 Changing the Guard takes place daily April-July and on alternate days August-March, at St James's Palace and Welling Barracks at 11am, and Buckingham Palace at 11.30am. It's free and you don't need a ticket.